Prince Charles and Bernie Sanders are on to something. There does appear to be a correlation between carbon dioxide emissions and world security. It’s just that they are holding one graph the wrong way around. 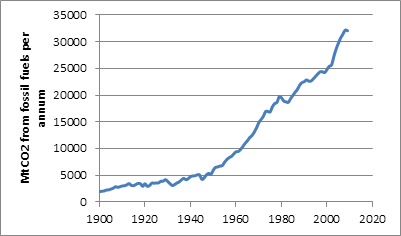 This is a graph of CO2 emissions over the last 100 or so years. And this is a graph of world battle deaths since 1947. It is the 1940s when the IPCC says that CO2 first started to have an effect on world temperature, so 1947 is a pretty good year to start a comparison at, and you can see how CO2 emissions start powering away at that point. Looking at the two graphs it is clear that there is some sort of correlation, and it is negative, rather than positive, because 1950 is a peak in battle deaths. It drops away to almost nothing today. I’m not naive enough to confuse correlation and causation. To move from correlation to causation you have to have a mechanism, and in this case I think there is an obvious one. That mechanism is that when people are more physically and mentally comfortable they are likely to fight less. A richer world is likely to be a more peaceful world. CO2 makes the world richer because it is an output of generating almost all of the energy we consume, and it is enslaving the electron that has allowed us to be richer than our ancestors dreamed was possible, even for kings and queens. Here is a graph of global per capita GDP. In this case there is a positive correlation between CO2 emissions and GDP. Now there’s a hockey stick you can love, and no sign of a Medieval Warming either. So, it may be counter-intuitive to those meeting in Paris, but it would seem that the solution to world peace, and world poverty, would appear to be more CO2, not less. Perhaps others might like to add to the correlations by unearthing some graphs for me on some other indicators of progress, such as global life expectancy. I think Prince Charles and Bernie might be accidentally onto something here. Happy to add to their knowledge with further graphs on this site. Graham, I see what you are alluding to. Do you have a graph which shows there has been no warming over the past 15 years or so, I can’t seem to find one? Simple correlations like this are simply not valid. And nor are the figures for recent deaths as shown in the graph above. For example, the war in Iraq had many more deaths than are depicted here. Perhaps they didn’t count deaths of locals killed during this obscene war. 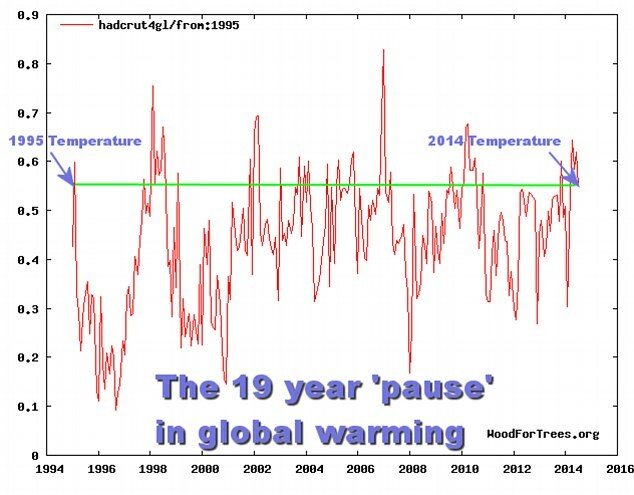 Hi Geoff, I wasn’t actually alluding to the global warming hiatus, but if you want a graph here is one http://i.dailymail.co.uk/i/pix/2014/09/02/1409668100834_wps_18_WUWT_png.jpg. The only weight I personally put on the hiatus is that it is well outside the model projections now, which tends to suggest, along with other things, that the models are too sensitive to increasing CO2, but that is another argument to the one that I am having here. I understand that correlation doesn’t equal causation, but there is a positive correlation between economic growth and CO2 emissions, which is recognised by the IPCC in the modelling that they accept. And I’d be interested to know what your alternative explanation is for the rapid decrease in battlefield deaths over the last 60 or so years. However, one thing is certain, there is no evidence here for the proposition that CO2 emissions, and global warming, has led to an increase in security problems. That is a complete furphy as there would need to be some sort of a correlation to be able to make a prima facie case for it. My hypothesis is that the prospect of climate change is causing the smart money to move into renewables, I’ll try to find a graph. Most of the professionals have moved on, leaving mainly the stragglers in the denialist rearguard. Sure if you reverse a graph or turn another upside down, you can make some sort of correlation for something? Perhaps the time it took to leave cav dwelling for man made structures? What the increased Co2 emissions may mean in real terms is the increase in energy use/mass production/automation? And there is cheaper cleaner energy just waiting for the smarter folks to catch on and understand where our future lays? We need to reclaim the production and distribution of energy in order to make it serve the economy rather that act as a huge brake on it! And that is why we have no choice than to stop dancing to the fossil fuel baron’s tune and those who play it for them! Large scale solar thermal in California and Arizona, built entirely by private interests, prove that real not theoretical large scale solar thermal can be rolled out at comparable cost to similar size coal fired projects; before you factor in the cost component of the fuel! Moreover, given the latest technology, also compete favorably as peak demand projects, with one exception, the fuel is forever free! Then we here in OZ are blessed with too much sunlight plus massive thorium reserves, enough to power the world for as many as 700 years? And for around half what we now shell out for 24/7 industrial energy and given the power bill, possibly enough inherent production costs, to save industry specific, steel and aluminum smelting in this country, as well as an automotive industry plus ship and sub building all of which have the have energy as the largest production component bill or are entirely energy reliant! Then we could if we were intelligently led, convert our domestic energy over to homemade biogas, made on site utilizing all organic waste, converted in an Aussie invented two tank process that converts much of it to biogas. (methane) Traditionally this gas is fed into diesel engines which power individual buildings. However after scrubbing it can be piped into ceramic fuel cells, which not only power individual buildings and provide endless free hot water, but give a virtually doubled energy coefficient produce a significant salable surplus; and doable for every occupied building at less than 25% of what we mug voters now shell out, and what’s more, from money formerly part of our economy boosting discretionary spend! The waste products from the latter production, being nutrient loaded sanitized waste water which if used on a visionary large scale, would underpin a viable algae oil industry and oil self sufficiency forever! Some algae are up to 60% oil and some types produce virtually ready to use unrefined, diesel and jet fuel. Extraction is as simple as sun drying then crushing some of the filtered product, with the ex crush material being suitable for a non arable land, non food source ethanol industry. I speak as someone coming to the subject from a background in chemical engineering and analysis. Then we have the prospect of vastly more efficient batteries and solar panels, due to the use in both or either of cobalt and or graphene or both, or some such? I don’t know what the problem is of adapting to lower carbon or carbon free energy? Except we must have among us folks who don’t like money or are too obtuse to see we can make mucho plenty money and quite massively improve our economic performance, just by adopting investing in some or all the above. Apologies and correction. have the have energy, should read; halve the energy costs. The stroke hasn’t improved my self editing skills, albeit left me most of my marbles and memory!